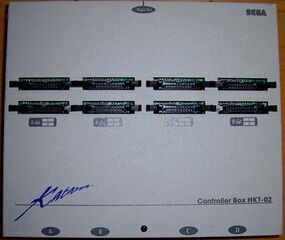 The Controller Box is a tool for Sega Dreamcast developers which allows for the programming/testing of controllers. It is one of the oldest pieces of Dreamcast hardware released outside of the company. It is extremely rare and largely redundant, with four Sega Saturn controller ports and eight ports for an obsolete memory card which was never seen. It has been suggested that the reason Sega Saturn controller ports exist (aside from the possibility that the Dreamcast controller had not been invented yet), is because at one stage the Dreamcast was said to be backwards compatible with the Saturn. More than likely the failure of the Saturn to catch on in the west prompted Sega of America to force this to be changed, as the price to pay for backwards compatibility was not seen as worthwhile.